Chalk it up to my busy life juggling multiple careers, but I hadn’t heard of Troy CLE until his name was submitted on the BBS website. As life would have it, once I knew his name, I became hyper aware of it. Suddenly Troy CLE’s name was everywhere. Most recently, as the Essence Literary Award winner in the Children’s book category. Troy’s path to publication caught my interest, because I’m a PR gal by day. But it was his book, The Marvelous Effect, that intrigued me. Books about adventure and fantasy, with Black protags, are the very books in short supply. 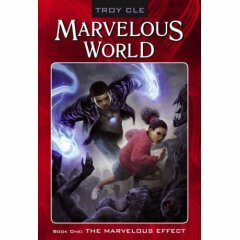 So, for the parents, librarians and teachers who have been waiting for a book that might get the adrenaline of their young male readers going – boy-wizard style- Marvelous World: Book One – The Marvelous Effect is CLE’s gift to you. BBS: How much of your getting a book contract do you attribute to it vs. the fact that your book fills a very real void? CLE: Since the release has sparked a tiny bit of controversy I took the time to document the entire story behind it. In short, I attribute my book deal and success to the fact that I wrote what many feel is a good book that countless teens and tweens of all races go crazy over. It is that simple. The Marvelous Effect had been self published nearly a year before “that press release” and was already doing well. What many don’t know is that “the Release” was an invitation for publishers and editors to witness what was being called “The Marvelous World Phenomena” in front of a group of students in Harlem. The honest reactions of the students to my book is what got me my deal. How many authors can say that? Most got their deals from agent presenting them to an editor. ABC News documented the reading. Without the kids who love my book I do not know where I would be right now. Another thing I want to point out is that I have found that kids actually go to the store and buy my book. Where alot of times books are bought for kids by their parents. My point is, kids choose my book. I find it so funny that so much has been said about that release when all it was was an invitation. BBS: When you sent the release, what in your most realistic expectations, did you think would come from it? CLE: When I sent the release I just wanted the publishing world to see how kids love my book. I knew if I did that i would get a deal. I was that simple. BBS: Why do you think books like Marvelous World, with African American protags, are so slow coming? CLE: I think that many published authors of color are focused on writing about certain cultural/social issues and periods. In short, they are not too concerned with fantasy. I grew up loving the same things that I and current tweens and teens love. That’s action movies, video games, and crazy fun with friends. In my opinion the best way to incorporate that in a book is to write within the fantasy genre. Also, I worked really hard to make sure that I did not let my audience down by writing a sub par book. Most people don’t know this, but The Marvelous Effect rests on a foundation of classical literature philosophy, video games and my favorite movies. My reviews for this book are pretty good. I just wrote about what I loved and knew and that gave it instant connection with any modern kid that reads it of any race or age. That really helped me get published once the industry noticed my book. My point is that maybe there are other books out there having a hard time getting published because they are not quite as contemporary as mine. Or they are out there and have not gotten the support that mine has received. I was fortunate enough to be able to do a lion share of my own PR to allow for me get the needed exposure to my audience and publishing world. So to all of the other fantasy authors who are out there PR is key if you have a good product that you want people to know about. We owe it to our readers to let them know there are African American fantasy characters of color out there. BBS: Share an experience with us that took place between you and a reader that spoke loud and clear to the demand for the type of story you’d written. CLE: What I am fortunate enough to experience is not just with one kid but with upwards of 250 kids in schools going crazy over my book cheering for Louis Proof. That is the greatest feeling. I don’t think people realize the connection that this book has with teens, tweens, and even adults unless they see them go crazy during my presentation. I have been in some really rough schools and I get kids to nearly fight and threaten me if they do not get a copy of my book. Marvelous World is serious and I am trying to change the way some kids think about reading. I was recently at the African American Children’s Book Fair in Philly on Saturday February 2nd 2008. If any one was there they could clearly see how I get both children adults excited. The organizer of the affair said she had ordered 40 Marvelous World books and Borders said they brought 100 Marvelous World books to the event. I do not know how many were actually there in total, but I was the only and possibly the first author to sell out of books during that major event. My point is there is clearly a demand for my book and an audience frequently voices it. BBS: Will this be a series or stand alone? CLE: This book is the first one of a series. Marvelous World Book 1.5 Olivion’s Favorites takes place during the middle of book one. Since he missed three months during his coma, so did you. It think it is a unique way to tell a story. Olivion’s Favorites greatly moves the Marvelous World plot forward in massive leaps and bounds and reveals how epic the story is. I do not know if my readers are ready for what is in that book–it is major! After that Cyndi Victoria Chase’s first book comes out and it takes place right after Louis’s last fight in book one. As of right now I am not sure how many books there will be in the series because I have side books like ones that focus on Lacey Proof. As far as the core series goes there are 5.5 books. I know exactly how the series ends. BBS: There’s a constant debate among writers on managing book promotion, specifically how much vs. focusing on good writing. What’s your advice to new authors on balancing promo and writing? CLE: I have a great time promoting my book. I get to go to schools and actually meet the kids who are reading my book and answer all of their questions. 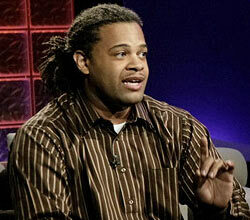 Also I do allot of TV, print, and radio PR about my book. I would not have be able to get this far if the press did not support me. You have to do those things if you want to spread the word about your book. In short, I write when it is time to write and promote when it is time to promote. I had to take moths off from promoting to write book 1.5 but now that I am done I am going on a school tour. Any teachers that would like for me to visit their schools should contact me here. I get my inspiration for my books from events in my life and people that I meet, so the more people I meet during tours and events the better it is for my writing. I wasn’t familiar with Mr. CLE either before this campaign, but now that I’ve read about his path to publication, I think he’s brilliant. He did it how he had to do it, and I have to wonder how many editors and agents would have taken on his AA fantasy novel had he not taken this creative route. I’m sure some eyebrows were raised. But I raise my applause.